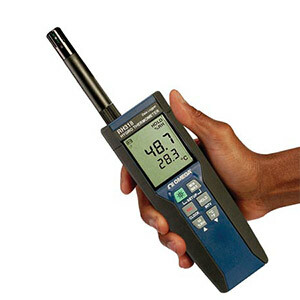 The RH318 is a low cost, high performance handheld meter with data logging ability. It offers a large dual back-lit display to show the temperature and humidity from a handheld probe and can display a dew point measurement. The temperature/humidity probe uses a semiconductor and polymer capacitive sensor and a thermistor temperature sensor. Windows® based software and USB interface cable is included to allow real time or recorded data to be read by a PC through the USB/RS232 port (RS232 interface cable is optional). Probe can extend up to 1.5 m (5') with optional extension cable. 참고: Comes complete with probe, NIST calibration, USB interface cable, Windows® software, carrying case, tilt stand, 9V battery, and operator’s manual.